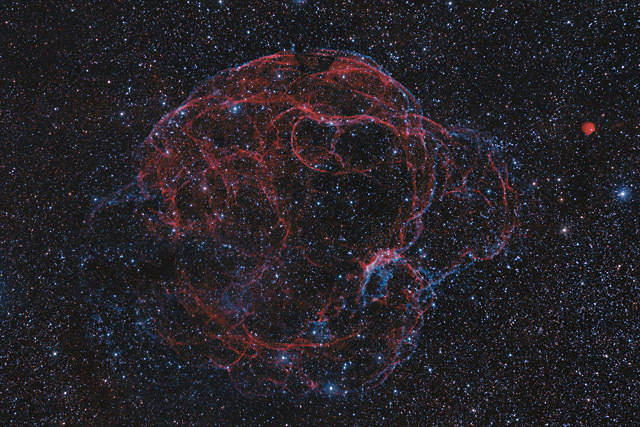 The Spaghetti Nebula (aka Sh2-240 or Simeis 147) is a large and faint remnant of a supernova explosion that occurred about 50,000 years ago. In the wake of the explosion, the supernova left behind a pulsar (PSR J0538+2817) - a spinning neutron star that rotates once every 143 ms (over 7 times per second)! The star that exploded most likely was once a member of the M36 open cluster in Auriga. To us, the nebula appears to cover a diameter of almost 3 degrees, straddling the borders of Auriga and Taurus. In reality, it is an object 150 light years in diameter at a distance of roughly 3,000 light years. The small, bright red nebula on the right side of the image is Sh2-242 (LBN826). In this image, North is Down. This image is cropped to 90% of the original frame. Software Used Images Plus 5.5 for camera control. Images Plus 5.75 for calibration, stacking, digital development, feature mask, star masking, smoothing and noise reduction, multiresolution sharpening and star shrinking. Photoshop CS5 used for levels and curves, hue/saturation colorizing, lab color, selective color, high pass filter, and unsharp mask. Gradient Xterminator for gradient removal. Registar for registration and stack alignment. Carboni Tools for additional noise reduction and smoothing. HLVG for additional color adjustment. Notes This beautiful supernova remnant proved to be extremely difficult to image. The RGB data contained virtually no sign of the nebula, while both the Ha and OIII data were quite weak. I took advantage of Images Plus' new Feature Mask tool, which allowed me to aggressively stretch the faint nebula without bloating the stars. I'm still learning how to use the Feature Mask well, but I'm quite pleased with the final result of this challenging image. This image was published by Astronomy Magazine as its Picture of the Day for November 20, 2014!